Wooing a diverse, fragmented and a large voter base of 813.25 million Indians can be quite an intimidating task. This election season, the Indian political parties are faced with this task, and data and strategy are the mandatory tools in order to accomplish it. 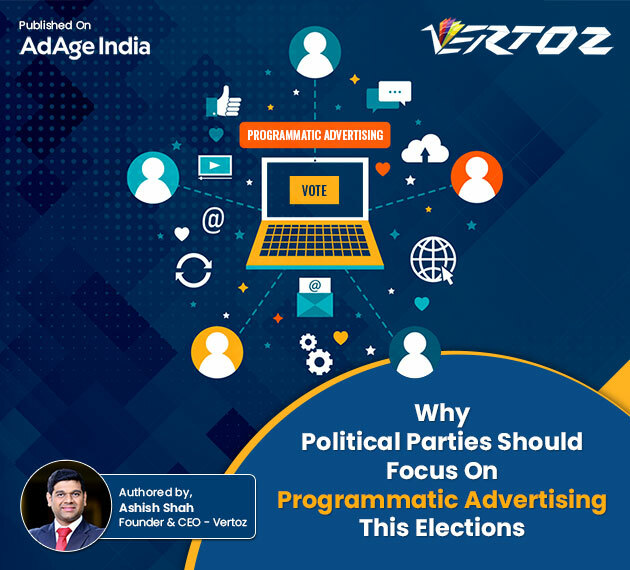 In his recent interaction with AdAge India, Ashish Shah, Founder & CEO, Vertoz shares a few insights on how Programmatic Advertising can be used effectively in running a winning political campaign. Here are a few excerpts. With India going digital, Indians are profusely utilizing various digital platforms. Thanks to the affordable handset prices and low-cost internet availability, India’s smartphone penetration is expected to reach 39% in 2019, as per Statista. As per Neilsen, Indians spent more than 50% of their total smartphone time in activities like social networking, chatting, browsing, video streaming, and on gaming apps. The digital footprints can be a great way to understand the voters and gain deep insights about them. Thus, reaching out to these voters on digital platforms and leveraging the power of data can work wonders for the political campaigns. Programmatic advertising is the perfect way to accomplish this Data is an integral part of the programmatic advertising functionality and enables crafting a data-driven strategy. Programmatic advertising enables parties to build effective campaigns that involve developing a deep understanding of the voters’ problems, frustrations and pain points. The advanced data crunching techniques of Data Management Platforms (DMPs) play an instrumental role. Programmatic advertising helps parties to target voters on parameters like political affiliations and demographics like income and age, the electorate. The voters can be categorized accordingly and delivered relevant communication to win them over. For more such insights, read the complete article here.